The morning was beautiful – hazy-bright, no snow, and best of all, no fog! 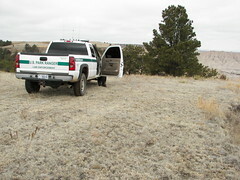 I woke early and drove to South Unit to meet up with the Badlands’ Stronghold Unit Enforcement Ranger, Vincent Littlewhiteman. We had a wonderful, relaxed morning; he took me with him on patrol, along the south and west boundary roads, and up to Red Shirt. On the way back we detoured off the road, onto a mud track that led off through meadows thick with mullein stalks — some taller than the truck! He drove out until we reached spots where we could really peer over the rim, down (and down! and out to the horizon) into the heart of the Stronghold Unit. We were at a high rim, near a sacred spot previously used for Sun Dances. An amazing spot. I immediately had the desire to spend a night there, smelling pines along the ridge, listening to coyotes, sleeping under stars. I am sure I will return — on a dry, dry day in a dry month! Vincent’s truck leaped and bounced through the rutty mud, no problem, but he’s been driving in fields of gumbo for years. I have the feeling I’d get my truck STUCK. 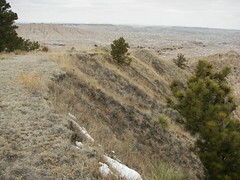 These badlands, previously (ab)used by the Air Force as a Bombing Range, are so vast they make some parts of the North Unit feel puny and groomed by comparison, but there is no scenic route or loop road twisting through the heart of the South Unit, no picnic area, no scenic overlooks with pit toilets. There is a small but excellent little Visitor Center at White River — closed for the season, but he gave me a quick tour — with an interpretive emphasis on Native history and culture. Actually, there is one scenic overlook near Red Shirt — we stopped there. No sign, no bench or walkway, just a pull-out with a gorgeous view and trash strewn in the ditch (there’s no garbage can). The NPS, and Pine Ridge Reservation, clearly could do so much more to make the South Unit more inviting to visitors (and draw more tourism money). Plans were made, in the past, but politics bogged things down (in terms of adding tourist facilities in the South Unit). I haven’t asked for the statistics, but I’d bet most visitors do not visit South Unit at all (most don’t even venture down the Sage Creek Rim side of North Unit). There are a few signs saying “Entering Badlands” and “Leaving Badlands” (where the roads cross park boundaries) but no gates or fee collection booths, as in the North Unit. Vincent, born at Pine Ridge, shared anecdotes, frustrations, and wonderful insights from his experience as a local, and an enforcement ranger. Great morning!